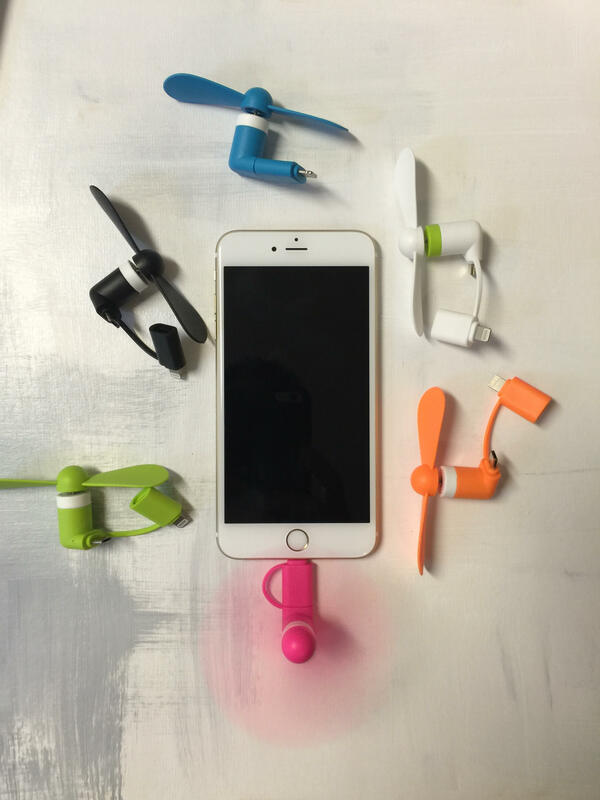 Beat the heat this summer buy yourself and your family a Smart Phone Mini Fan. Beat the heat this summer buy yourself and your family a Smart Phone Mini Fan. You can use this Mini Fan using your iPhones, iPad or any Android Phones. 1 Package include 6 different colors (Green, Black, Blue, White, Orange and Pink). MINIFAN SUMMER ESSENTIAL. Smart Phones Powered Portable Fan. Best cooling fan solution in hot summer. Low noise with low power consumption. SAFE AND EASY TO CARRY. Model is made of TPE environmental protection material. Mini design, ultra-quiet and strong wind. SUITABLE FOR ANY SMART PHONES. Suitable for many kinds of Apple devices, iPhone SE / 6 / 6S Plus / 5 / 5S / iPod Touch 5, iPad, Samsung, Tablets and other Android smart phones. DURABLE MINIFAN. The motor speed can reach 16000RPM, 100 hours continuous working hours at maximum. 2 in 1 MINIFAN. It is the most popular Smart Phones (iPhone and Samsung) accessories this summer. BRAND NEW with 1-year limited warranty. Discount Code: Buy 2 get 25% OFF. Don't forget our product is a 100% Amazon Money Back Guarantee so you can order with confidence. A simple way to say thank you for trusting our product. Copyright © QUE USA 2016. Sold Exclusively by QUE USA. Products sold by QUE USA brand are original, and no other sellers are authorised selling our QueUSA Minifan. Our shipments are available in the USA and will deliver within days not like our counterfeit competitors. Visit: QueUSA.com website for details.